Sometime in the early '80s, before I turned 10, my grandmother told me: "You should go to Howard." In our family, Howard University was this revered place, partly because one of my uncles had been a quarterback there in the late '70s. But I dismissed the idea, almost as fiercely as I resisted football, having grown up in mostly private, predominantly white schools where everyone, it seemed, aimed for the Ivy League. By the mid-'90s, my parents made clear: If we're paying for college, you're going to a black school. Maybe it was something they'd heard in my voice. Or my preference for Madonna, Michael Jackson and Depeche Mode. Or my rejection of the black Pentecostal church they'd started attending. Here's what they were really saying: Our middle-class kid is confused and needs to figure out he's black. So reluctantly, I went to Howard. Historically black colleges are on the brain partly because two weeks ago, I went to a White House conference on how the schools can be entrepreneurial hubs. It's an important conversation that reflects the country's start-up economy: Some schools are, smartly, launching programs to train not only the next generation of employees but also independent job creators. The conference was notable for its venue, and President Obama himself has said this about HBCUs: "People who say they've fulfilled their purpose, that after all the progress we've made, their reasons for being are obsolete. It's because of these schools that the black middle class is filled with black doctors, lawyers and engineers. It's because of these schools that one of every two wide-eyed freshmen is the first in his or her family to go to college." Still, I left the White House thinking not only about entrepreneurship but also about the question of HBCU relevance. It may seem like a strange question, especially for The Root's core audience. But consider that budget pressures are forcing state legislatures and the federal government to reconsider financial support for HBCUs. The schools are turning to private financial sources and recruiting nonblack students. 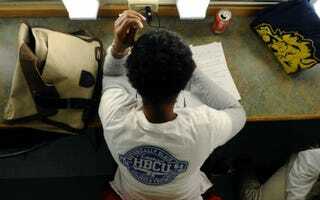 The number of black students in college is growing, and nearly 80 percent of them attend non-HBCUs. That should be viewed as a measure of social progress, a reflection of greater access to choice often driven by predominantly white schools' rich endowments. Still, HBCUs produce about 40 percent of America's black science graduates and a significant share of its doctors, judges and business owners. But every so often I'll get a question from well-meaning white friends: "Why self-segregate — is it some kind of militant thing?" My response boils down to this: Going to Howard was no different from certain Jewish friends spending a year or longer in Israel. It's a break from the pressure of assimilating into an American mainstream culture from which we're often made to feel isolated. The experience deepened my confidence that it's very possible to be successful without working for someone else. Let's get back to the White House conference's main point: Can HBCUs become entrepreneurial talent hotbeds? It's worth taking a look at the all-female Bennett College in North Carolina, where its president, the economist Julianne Malveaux, has claimed that many of her students will work for themselves at some point in their lives. During her talk at the conference, she brought up an example of an easy way for students to start thinking about being an entrepreneur. She offered, "If you're braiding hair for recreation" — say, in a dorm room — "why not charge your girlfriend $20 for your time?" Four years ago, Bennett opened the Center for Entrepreneurial Studies, which now directs about 30 students through an entrepreneurship minor in courses like accounting, marketing and finding government contracting opportunities. One student proposed turning half of Bennett's vacant greenhouse into a farm. The first vegetables will be ready to hit the market soon. At a moment when the country's competitiveness depends on an educated, innovative and diverse workforce, entrepreneurship is one additional area in which HBCUs can prepare students to excel, and ultimately continue to be relevant institutions of learning for new generations. Steven Gray is a contributing editor to The Root. Like him on Facebook and follow him on Twitter.